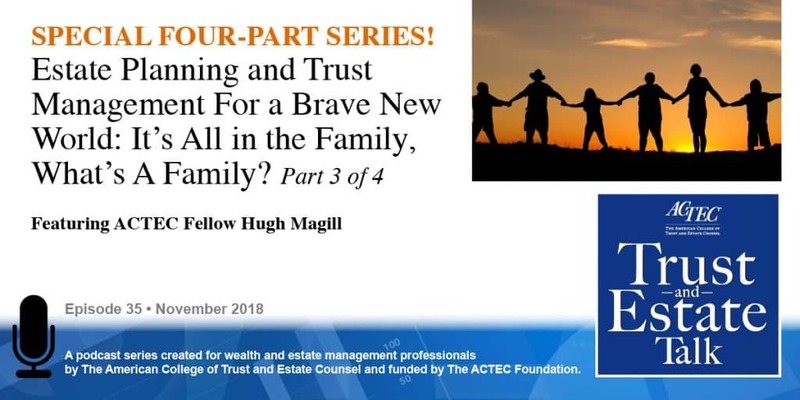 Welcome to podcast Part 3 of 4 of “Estate Planning and Trust Management for a Brave New World: It’s All in the Family, What’s A Family?” This podcast is a special edition of ACTEC Trust and Estate Talk. This is Susan Snyder, ACTEC Fellow from Chicago, and I am pleased to introduce ACTEC Fellow Hugh Magill also from Chicago. Hugh delivered the prestigious Trachtman Lecture at ACTEC’s Annual Meeting in March of 2018. In our previous podcast, Hugh discussed how changing demographics and multiple generations impact our new world of estate planning and trust management. Today he will continue his lecture by discussing how trusts need to evolve to serve these new family dynamics. So how will our engagement with contemporary families evolve to ensure that their wealth management, their wealth transfer goals will be achieved. The implications of these changes have often overwhelmed me in the last year or two. Much good work is already being done in your practices in the committees of the College. I offer a few observations and indeed many questions about the implications of these changes in the sections which will follow. First, looking at the left-hand side of this slide, all of these changes have implications that I list in the right-hand side. How will these families allocate wealth? How will their trust evolve? What are the implications of much longer lifespans? And last, how will these families collaborate and make decisions? Let’s explore this first question by considering an even more basic one, the haves and the have-nots of estate planning, the testate and the intestate in the United States. There have been numerous studies across the United States from Consumer Reports through academic studies generally find a testacy levels in the 50% to 70% range in the United States. Here I show the results of one conducted in 2009 by Stanford law professor Alyssa DiRusso. 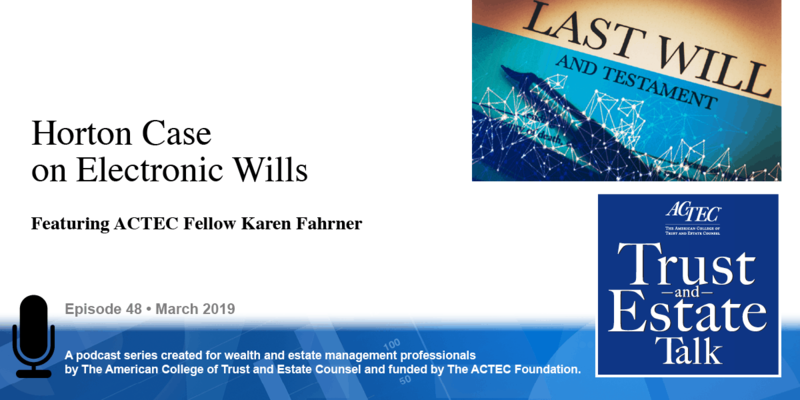 She surveyed 324 respondents across 45 states finding that 68% of them had no will, about 20% of them had a will drafted by counsel, 11% practiced self-help and 1% didn’t even know. [SLIDE 45] But a much more comprehensive review has been done by a longitudinal study at the University of Michigan. Begun in 1990 under the auspices of the National Institute on Ageing and the Social Security Administration, it is called the Health and Retirement Study (HRS). HRS surveys every two years 20,000 Americans aged 50 and up on a wide range of issues relating to their health, their income, their production of and consumption of wealth in retirement. Participants span a broad range of attributes socioeconomically, geographically and racially, and one of the things they survey every two years is intestacy. In general, what they find, 42% of their respondents have no will at the time they are surveyed, and 38% will die without an estate plan in place. So much lower statistics than generally are found but there is a striking correlation between three attributes and substantially higher levels of intestacy. First, families with stepchildren: 49% of these respondents do not have a will. And in families, tragically where there has been a breakdown in a relationship with an adult child cut off – emotional cutoff for at least a period of a year: 59% of these individuals will not have a will. And last, sadly, divorce respondents: 62% do not have wills. So in an era when we are raising questions about where the subject will come for us to address, you’ll have much lower levels of taxation impact. I think it’s an opportunity to join with the matrimonial bar in at least addressing one of these phenomena. The other two are going to require some sensitivity and creativity. I will talk about that in a moment. But I think it’s difficult for these groups, step families, those with emotional cutoff, divorcees to do this. Why is it difficult to undertake estate planning? I would suggest it’s difficult because it’s harder to answer estate planning’s fundamental questions. They’re the following. Who will inherit? ; second, how much? ; third, when should they receive it? ; fourth, should we leave it outright or in trust? ; and fifth, who will step into our shoes? These are weighty questions for every client, suggest they are more challenging for the individuals on the prior page and for contemporary families. Now economists have been intrigued for years by this issue of wealth allocation, and they are puzzled by the fact that families tend to allocate wealth equally among children of equal relationship. So their concern with the who of this and their rational economic modeling would suggest that individuals would not generally leave wealth equally among collateral descendants. They have come up with three theories to justify their expectations. The first is called the Altruist Model where they suggest that parents want to leave wealth in a way that equals things out amongst children of different means. The second so-called Exchange Model indicates the parents would leave wealth to compensate those who have cared for them, wealth in exchange for services. And the third, the Evolutionary Model suggests that parents will leave wealth to children who are likely to beget grandchildren, funding for the production of heirs so to speak. Some academic researchers though attribute equality in wealth allocation to a different phenomenon. They say that we are fearful about unequal distributions because of the risk of litigation but fortunately, mother knows best. American mothers, when surveyed, respond by saying, and 92% of them say this that they will leave their wealth equally to children. Questions about wealth allocation in the United States are possible, indeed possible because of a central tenet of American law that of freedom of disposition. Our clients are free to allocate their wealth along this spectrum in any way they wish with only limited public policy restraints. Immigrants to the United States may find this a bit puzzling, a bit confusing. They may come to like this freedom. On the other hand, they may hue back to the countries of their origin and the cultural or legal or religious dictates for the disposition of wealth. But let me return to the family with which I began today’s presentation, and what I didn’t show on the early slides was the compression in age gaps between the members of this family. The father, the traditionalists is only 15 years older than his boomer spouse, and she is only 15 years older than her stepchildren. He is from the prior marriage, and they are roughly 15 years older than their half siblings, the millennials descended from the marriage. The wife is concerned in the planning process about the so-called traditional approach to deferring the children’s inheritance until she has achieved mortality, the life estate/remainder construct and, of course, we are all familiar with that phenomenon today. And what she does and what she fears is that her stepchildren will see her as an impediment to her inheritance, and they will be frequently renting this movie (Throw Momma from the Train) on Netflix. The plan that arose out of many discussions with this couple combined lifetime gifts accelerating the children’s inheritance with testamentary transfers to provide for the wife and the grandchildren. So they rejected the traditional life estate/remainder construct of wealth transfer but critically this plan rests upon important conversations with the family. I would suggest they are crucial to its success. The children were advised that their lifetime transfers would constitute the entire amount of their inheritance, so they did not have to look through their stepmother. Let’s look then at the role of a family dialogue in this process. The dispositions of wealth by the Greatest Generation were generally ones that precluded discussions about wealth and wealth transfer. These were things that we didn’t talk about as a family but for contemporary families today, the leading generation, boomers, they need and they want to discuss these issues, but they need help in the process. They did not have a model to follow, and they need our counsel to know how to have these kinds of conversations. We will talk about this in just a few moments. The plan that we just saw for one wealthy, blended American family raises a host of issues, and I think we will have general utility in planning for contemporary issues. From first, the adequacy, a financial wealth, wealth sufficiency, to the advisability of working together to maintain assured asset, such as this family’s cottage. Issues this family faced and their advisors’ approach suggest an evolution is underway in our approach to both estate planning and trust management. What are these approaches looking like? First, estate planning. Initially a focus that maybe less centered on transfer taxes in an era of dramatically increased transfer tax exemptions, one that is more oriented to family goals in a tax efficient matter. One that is less paternalistic and colloquial to a process that is more engaging and adaptable to family composition, one that is less singular and less colloquial to one that is more cognizant of cultural perspectives, and one that adds to its perspective on the balance sheet, an enlarged understanding of each family and each family member’s total wealth. Fiduciaries are encountering a similar paradigm shift with the bottom boxes of the same and the top which suggests that what his previously banning continuous to be an unchangeable focus on grantor intent, maybe moving toward expressions of intent which are more aspirational and flexible. So I would like to turn now to the design of trust themselves. I think it’s axiomatic to this group, the trust prescribed the ways in which financial wealth will be managed for beneficiaries by codifying grantor intent, of course, in a trust agreement, an agreement interpreted within its own four corners. The divide the trust must navigate has always been large but I would suggest that today it’s even larger owing to the changes and the differences in generational attributes on the left side of this chart, the grantors, traditionalists and boomers today and the attributes of their beneficiaries, Gen Xers and millennials. Also, the changes in marital practices and family structures. The good news is that the divide is less constrained by the impact of transfer taxes. Let me start by thinking about the reasons why trust exists and how this finds expression in the trust agreement. Those of us who are in-house fiduciary or trust counsel see an awful lot of trust agreements as you do as well but rarely do we see trust which explicitly state their purpose rather we infer that purpose by reference to various provisions relating to the four basic elements of a trust – its custody, its administration, its management and its distribution functions. That inference often leads to predictable conclusions, ah, this is a QTIP Trust under 2056 (b) (7) or this maybe an ILIT with Crummey withdrawal provisions under 2015, 2514(e). On a deeper level though, what if grantors were encouraged and indeed equipped to communicate to both their fiduciaries and their beneficiaries about why they entrusted their financial capital to the trustees and for their beneficiaries. It leads to something that we call a Statement of Intent, and it’s one that will also serve as fiduciaries who are familiar with the challenges of mediating the divide between grantor intent and beneficiaries navigate that divide. That divide is sometimes substantial enough that it leads to attempts to terminate trust and, of course, it leads to many conflicts in the administration of trust. The early termination of a trust is permissible as long as it doesn’t run afoul of a trust so-called material purpose. This harkens back to 1889, Massachusetts case that has led to the so-called Claflin doctrine. The Claflin doctrine has found ample expression in the provisions of the Uniform Trust Code (UTC) and the material purpose services the subject which must be identified for a number of actions under the UTC. But what could we gain if material purpose were less a matter of inference and one more of explicit expression. This is the concept behind a Statement of Intent, and this statement has two audiences in mind. First, the trustee. Communication to the trustee that is first neither an external letter of wishes which are involved in practice outside the United States but increasingly within the United States but it is also not internal placatory language rather it’s language within the trust document itself, and it expresses the grantors unique personal rationale for that trust purpose. It also addresses the grantors views and the life span of the trust and speaks to the fiduciaries responsible for exercising various discretionary powers. And today in a period of reallocation of fiduciary responsibility, they are often more than one, and one set in particular that of trust protectors as they exercise latent powers that may lie decades in the futures. What will guide them in the exercise of those powers? I suggest that a Statement of Intent can be an excellent source of guidance. The second and perhaps equally as important audience is the trust beneficiaries themselves. It’s easy to forget that trusts are a form of communication and indeed often the last communication from a grantor. How many times have we seen beneficiaries thumbing through a trust agreement? And the cynic in us would say we know what they are looking for. They are looking for their name and a dollar sign after it, but I think some of them are looking for something else. They are looking to ascertain whether or not the grantor said something to me. We must remember that there are no two-way conversations at the cemetery. A Statement of Intent offered to beneficiaries is neither an ethical will, that’s something outside the trust document that conveys family values nor is it a family mission statement. Rather this Statement of Intent speaks to the why a family wealth held in trust providing insights about family values and expressing hopes for the beneficiaries yet to come. 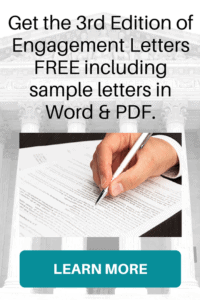 We, of course, cannot author these but we can encourage our clients to do so. A good resource, a recent article in Trusts & Estates magazine by Raymond Odom, the gold standard of estate planning talks about the statements and offers this paragraph as an example of a Statement of Intent. Statements of Intent are especially important in this era of perpetual trust made possible, of course, by the widespread repeal of the rule against perpetuities recently refueled by the doubling of gift in GST tax exemptions. Trust on the right-hand side of this spectrum will speak to multiple generations of beneficiaries, many of whom will never have met their grantor and that audience of beneficiaries will grow ever larger. We began a study in 2011 looking at asset growth, in trust portfolios, trust design and distribution history, taxation of trust earnings and, last, family growth. Several colleagues who participated in formulating the study are in the audience today. And we particularly focused on family growth by looking at the total fertility rate in the United States, and today it’s just shy of two as you will see in a chart in a few moments. By the fifth generation of this family, their perpetual trust would have 28 living beneficiaries. And if the trust were to last as long as one of our clients hoped in revocable dynasty trust he established in the late 1990s intended to run for 600 years. That seems unimaginable but in 600 years, the 20th generation of this family would give birth to 524,288 beneficiaries. That trust is looking more like a multiemployer pension plan. Trust designed to run past the rule will have to have very thoughtful set of beneficial interest all arrayed on this chart from mandatory income distributions to withdrawal rights to powers of appointment, all the things, the so-called bells and whistles which are vitally important to the beneficiaries of every trust. The standards which govern discretionary distributions are, of course, the heart of the trust and while they span a continuum from the very narrow on the left that of emergencies to the very broad on the right, pleasure. 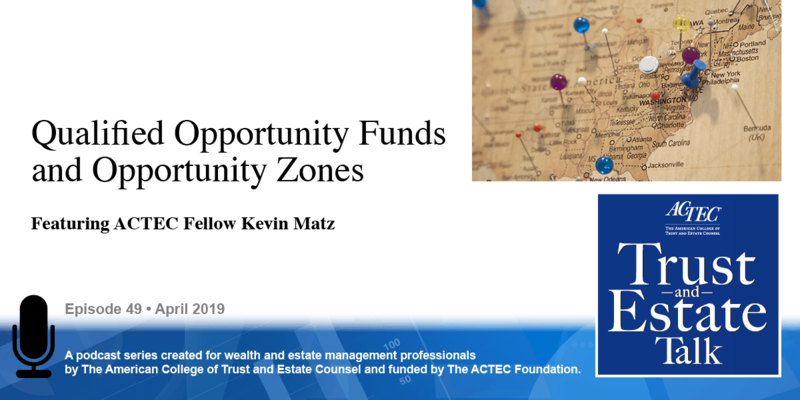 The distinction between ascertainable and non-ascertainable standards has fulfilled an important purpose in insulating trustee beneficiaries from the risk of estate tax inclusion but at what cost? Informal surveys that we have done with lawyers would indicate that there is a higher use of ascertainable standards than necessary. And fiduciaries when trying to cope with new circumstances, new family structures, things they could not anticipate welcome broader standards of discretion to give them greater flexibility in achieving the purposes of the trust for new generations of beneficiaries. A final observation on substantive trust design that have spray or sprinkle trust. I would suggest that for modern families spray trust have limited compatibility. We all understand their advantages. They permit unequal but equitable distributions. Their efficiencies in the comingling of assets, they are very useful for minor beneficiaries of the same degree but they present fiduciaries with multiple challenges. They present them with competing fiduciary duties where the fiduciary is held to confidentiality as to each beneficiary but a duty to provide information to all beneficiaries, and they sometimes present insurmountable difficulties in building a trust portfolio which is well suited to each beneficiary’s unique risk tolerance and marginal tax rate. I have a simple rule of thumb about spray trust: if beneficiaries can’t live together in the same house, they shouldn’t live together in the same trust. We all know that there is a wide range of general trust provisions usually based upon standard form language. I would suggest that these provisions in trust would benefit from reevaluation when drafting trust for modern families. Let me just highlight one or two. First, the administration of a trust during the period when a grantor becomes disabled, some would say it is the most difficult period in fiduciary administration and management. Management of a trust during that phase is often one where dependents seem to incarnate themselves spontaneously, and the question is how do we determine whether or not they are really dependent and does the trust agreement allow us the latitude to either recognize them or exclude them in a way that’s consistent with the reshaping of the American family and its relationships? Is that standard clause aligned with each grantor’s unique intent family and support circumstances? And second, prudent investing. The Prudent Investor Act which was promulgated in 1994 could not possibly anticipate the developments in socially responsible investing but beneficiaries, particularly millennials are increasingly interested in and strongly devoted to this ethical aspect of investing, and they expect their trusties to do so in their own trusts. So let me close this topic with some imagery about the role of trusties and is somewhat will sort of a geometric attempt to portray some of these weighty issues. In days gone by, the trustee role seemed relatively straightforward. The grantor at the topics plus grantor intent through the trust agreement endowing upon the trustee a set of fiduciary responsibilities for whom they were supposed to exercise these two sets of beneficiaries to whom they owe duties: the current and the remainder beneficiaries, but so much has changed. On the upper left-hand side, fiduciary responsibility is being reallocated broadly pursuant to statutes such as administrative or directed trustee statutes. The most recent of which was promulgated by the Uniform Law Commission. On the upper right-hand side, there is an increasing array of statutory powers. Discretionary powers granted by statute which trustees may exercise in order to adapt their trust to wide ranging and changing circumstances. And at the bottom, trust documents which grant trustees broad powers to fundamentally alter much of what their trust original design was intended to do. That fiduciary domicile looks suspiciously like a mystical pentagram. Fortunately, it’s only a hexagram. There are three points of fiduciary obligations, three sources of fiduciary authority but the complexity of this alignment is much needed as trustees navigate a period of vast demographic change. 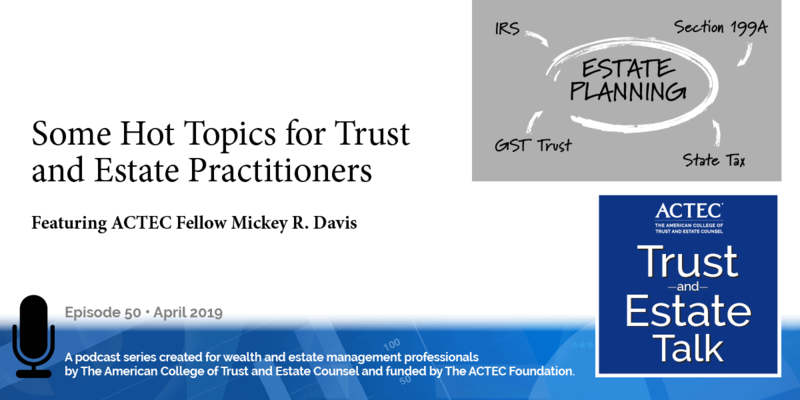 This concludes Part 3 of 4 in our special ACTEC Trust and Estate Talk. Please tune in for our last podcast in this lecture “Estate Planning and Trust Management for a Brave New World: It’s All in the Family, What’s A Family?” which will look at longevity and its implications.